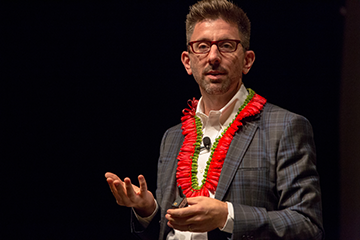 Internationally renowned as an innovative educator, John Hunter spoke to an enthusiatic audience of over 1,000 public and private Hawaii school teachers as part of the fourth annual Schools of the Future Conference held October 23-24, 2012 at the Hawaii Convention Center. 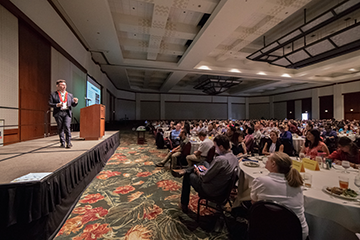 This conference was a particularly exciting venture as the Hawaii Department of Education and the Hawaii Association for Technology in Education joined for the first time with the Hawaii Community Foundation and the Hawaii Assoication of Independent Schools to sponsor the event. Achieving World Peace: Kids' Stuff? Though the Nobel Peace Prize is bestowed on a global leader or group working toward a more harmonious society, the solution to world peace seems to have been figured out already in a fourth-grade classroom at a public school in the Blue Ridge Mountains of Virginia. There, over the course of 6-10 weeks each year, teacher John Hunter walks his students through a hands-on political simulation he invented in 1978 and calls the World Peace Game. The genesis for his unique teaching program began during Hunter's own university years, when he was traveling throughout Asia and studying comparative religion and philosophy. He began to wonder how his profession might contribute to peace and how he could teach peace in an often-violent world. The centerpiece for the World Peace Game is a 4'x5' plywood structure with four levels and hundreds of game pieces, representaing all of the players, all of the places, and all of the influences that comprise our troubled and interconnected planet. From undersea to outer space, from nuclear proliferation to global warming, 9- and 10-year-olds are tasked with working through a set of 50 large-scale, real-world problems. "Winning" can only be achieved when the solutions leave all of the nation teams better off. It's a lofty challenge at any age, and one deemed impossible by many professionals who possess a sophisticated understanding of the dark forces of violence and power at play around the globe. "It is precisely because they don't know they can't," says John Hunter of his students, "that, in fact, they can." He begins the World Peace Game with a heartfelt apology to the fourth graders in his class: "I am sorry we have left the world to you in such sad shape." But, equally heartfelt, is John Hunter's unabashed confidence in his students: "I don't know the answers, but I know you, and I trust that you have what it takes to figure them out." From that potent foundation of love and fear, the youngsters begin to grapple with the unknown, making meaning from the chaos by coming to understand the very human forces that steer nations toward combat and away from collaboration. "We typically shield kids from complexity," states Hunter, who believes that uncertainty and even failure should be part of the curriculum, as they are part of life. At a certain level, the World Peace Game is a ruse; it's a mirror for participants to see who they are in the face of frustration and conflict and notice how their actions play a part in what happens...to the world, to others, and to themselves. In life and in a game where the stakes are high and decisions have consequences, John Hunter provides a safe space for elementary school students to gain self awareness and critical thinking skills that will serve them as they grow into a world that desperately needs their wisdom. The fact that Hunter and his students were invited to the Pentagon to meet with Secretary of Defense Leon Panetta suggests that no one should be considered too naive to teach or too jaded to learn.